Pink is just one colour in a rainbow. My earlier work contrasted the fantastical perfection of ‘romantic childhood’ as portrayed by eighteenth and nineteenth century artists (and which continued to inform artists well into the twentieth century) with the arguably more honest portrayal of children by more contemporary artists like Sally Mann and Marlene Dumas. Conflating, in a way, these shifts in portrayals of children, and adding to my increasing awareness of the unspoken prevalence of abuse of children in our society, I used etchings of children to juxtapose the notion of the‘pure’ child with the violence and violations hiding behind the facade of social respectability. In later work, I developed this theme with images examining the commercialization of children—and the exploitation of this vulnerable demographic by canny advertisers—by creating images of children at play incorporating the cultural iconography and lifestyle branding which have become such inescapably targeted elements of their developmental environment. You can see images of these works in the 'Under a blanket with a torch' and 'Madworld' pages on this site. In the last ten years, I have became mother to two girls, and this has led to my becoming interested in the significant changes to societal ideas and values regarding visual representations of children that I have witnessed over the past decade or so. 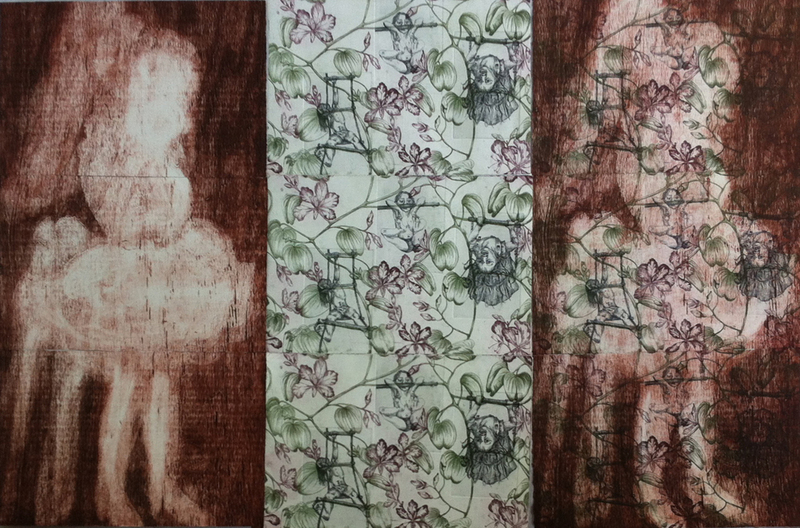 In my current work, I use printmaking to investigate the dual role of mother artists, representations of childhood, and the commercialisation and sexualisation of childhood in the digital age. I aim to visually represent the ‘knowing child’ and contribute to the discourse on children in art. As a medium that has historically offered an artistic avenue for women, I believe that printmaking can bridge the controversies surrounding photographers working with the mother’s gaze and provoke discussion of the cognitive dissonance inherent in conflicting social attitudes towards and reactions to representations of children in art in contrast to commercial media and advertising. The imagery and techniques employed in this project reflect and build upon the darkness of certain German expressionists and depictions of motherhood by artists like Kath Kollwitz and Mary Cassatt. These influences combine, almost playfully, with the aesthetics of repetitive wallpaper, as well as more contemporary and commercial icons of childhood. Inspired by the work and experiences of contemporary mother artists, primarily photographers, its context owes a great deal to discussions of parenting and childhood (particularly of daughters) in the digital era, as well as the concept of nomadic thought. The result is a series of multi-panel prints that reference Victorian and Art Nouveau aesthetics, particularly with regard to wallpaper as a boundary-marker of the domestic sphere. Imagery is informed by representations of childhood ranging from Victorian memento mori to modern, hyper-stylised commercial iconography. The repetitive patterns are overlaid with, and partially obscured by, silhouettes derived from photographs of my children playing. These patterns, images and shadows also document the growth of my children, and our mutual engagement with externally imposed narratives of childhood including Disney fairytales, gendered and sexualised commercial products, and the programmes and advertising that inform much of the behaviour and cultural symbology of contemporary childhood. Installed as ‘wallpaper’ in a colonial cottage, my work seeks to place itself within a domestic space in order to encourage and participate in dialogue regarding the ways in which the domestic sphere is permitted to be depicted and observed, the right of parents to document their children’s lives, and the ways in which domesticity is infiltrated by commercialism. This idea comes from a desire to turn a pile of sketches I had done based on ad hoc portrait photographs I had taken of the girls—generally these happen when the subject becomes aware of the camera and edges closer and closer to it, pulling a face or shoving something they want you to see at the lens—into etchings. For me this imagery captures the essence of the individuality in my girls. The birds’ flamboyant plumage and displays are designed to attract mates, and I could see parallels between this and the radical adornment of the pageant girls to please the adult gaze and, perhaps, to reassure parents that they have bred something that is attractive to others and is therefore more likely to pass on the parental genes (‘Selfish Genes and Tiaras’?). The fact that it tends to be the male birds of paradise who possess the plumage and perform the dances also subverts the performative gender roles embodied by the pageants. For my toile, I based the images on photographs I had taken of my daughters showing them engaging in creative play, often ‘Disneyfied’ in nature by received societal expectations of gendered play, and utilising toys and costumes from the ‘pink’ section of the toy department that encourages girls to be good little mothers- in-waiting—having tea parties, applying make-up, and role-playing scenarios in which they wait for their prince to rescue them. These images of the girls, each executed on individual small plates, are not restricted by arbitrary notions of time and space. Within the wallpaper they climb and swing through the endless bifurcations of the bauhinia branches. With little effort, they can go anywhere; achieve anything. I think that this is an important contrast to the all too common constraints placed on girls—reinforced by expectations that they will be good, nice, and beautiful. The three figures inhabiting the wallpaper are not unsexed per se, but are vaguely androgynous and free to shift genders and dreams at will. They are stripped of the material iconography that delineates gender from early childhood in the twentieth century.